In the athletic village at UCF. 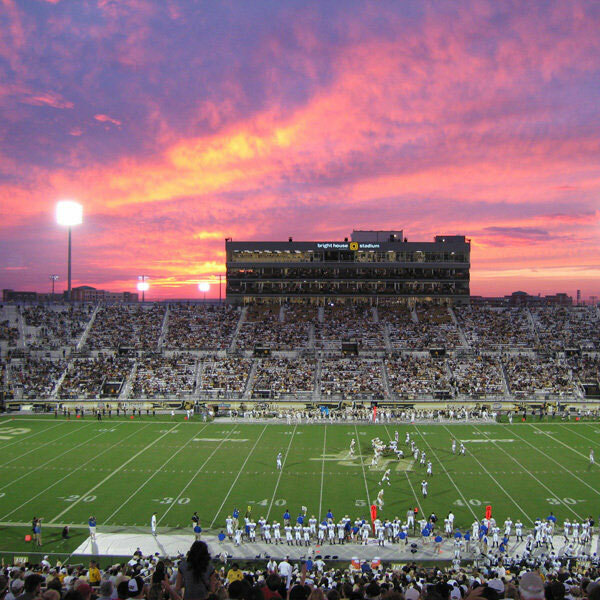 Bright House Networks Stadium is the the home arena for the University of Central Florida Knights football. The stadium was completed in 2007 and has a capacity of just over 45,000 people. It's the first on-campus sports stadium in NCAA Division I FBS to open in the 21st century. Students have given a variety of names to the stadium. It's been called "the Dungeon," an allusion to their medieval theme; "the Bouncehouse" or "the Trampoline" due to the bleachers' tendency to bounce when fans get excited; and "the Bright House" which points to the sponsor for the stadium. 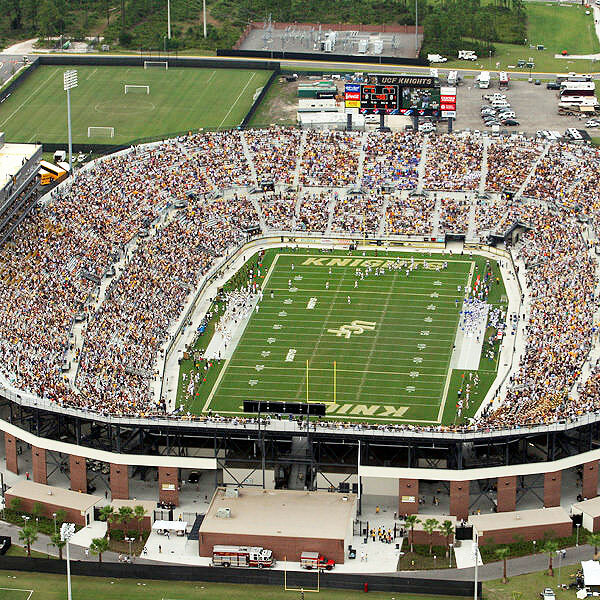 The stadium was built as part of an athletic village for the school's growing sports program, along with a new softball complex, the only Division I indoor football practice facility in the state, and CFE Arena. During their opening season, the Knights lost their first football game, but when on to be undefeated for the remainder of the season. 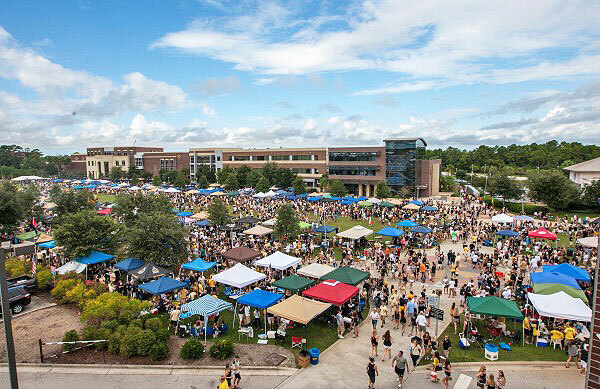 Tailgating outside the stadium is permitted as long as attendees follow the rules of conduct which include avoiding lewd or drunken behavior, vandalism, and littering, along with many other regulations regarding what kind of tailgating materials are recommended and which should be left at home. Food and drink are not allowed into the stadium, and neither are umbrellas, coolers, video cameras, or large bags. Bags may be inspected upon entering the stadium. There are four parking zones: Gameday, Gold, Red, and Blue. 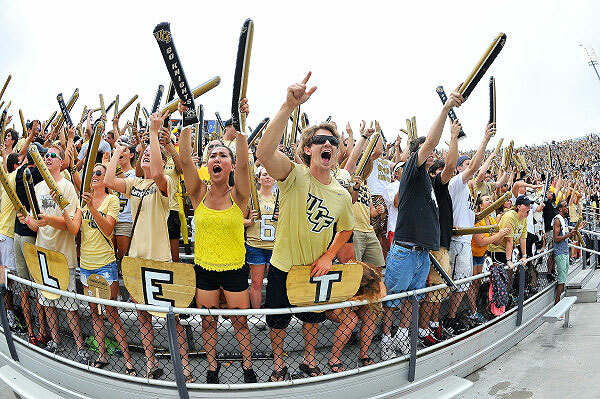 There is also Disabled Parking on the first level of Garage D.
Bright House Networks Stadium is located on the northeastern area of UCF campus between the soccer field and the football practice field.